As Minnesota continues to struggle with its care crisis, measures are being taken to address the critical need for direct care workers. Efforts are stepping up to implement the enhanced rates for the Minnesota Department of Human Services (DHS) programs. The programs involved are Personal Care Assistance (PCA) Traditional and PCA Choice, along with Consumer-Directed Community Supports (CDCS) and the Consumer Support Grant (CSG). One piece of the enhanced rates, which have been in the works for several years, took effect July 1 for PCA and CGS programs. DHS is still in the process of seeking federal approval for the changes in CDCS and extended PCA on a support waiver. 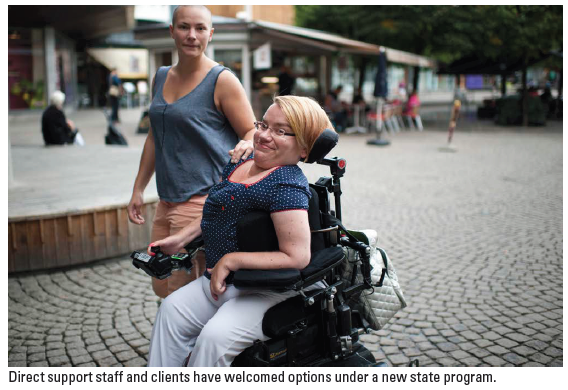 Enhanced rates are seen as a way of helping people with high-need disabilities to have more highly trained staff and more control over services and supports. A key focus is on helping people who need a higher level of care, and care for 12 or more hours per day. Another goal is to help direct support workers, by offering them a training stipend and the ability to move to higher rates. Higher rates are offered for people who have gone through training and who have the right academic background. The $500 stipend is only available to the first 5,000 who apply for it, in PCA Choice, CDCS, and CGS who complete qualifying training. People could apply starting July 1. The stipend for PCA Choice, PCA Traditional, CGS, and CDCS requires completion of three courses from a menu of options. One requirement is to learn online about the history of the disability rights movement. Other options include courses in CPR, first aid, occupational health and safety, safe patient handling, independent living, managing the stress and challenge of paid caregiving, oral care, basics of grooming and dressing, personal care and direct support professionalism. For the enhanced rate for workers who help clients eligible for 12 or more PCA hours a day, four courses are required. Another option to qualify is through past education. A current CNA, LPN or RN license or HHA certificate can help a caregiver meet the requirements and take fewer courses. Workers may qualify for either the five percent wage increase, the $500 stipend or both. . It depends upon whom the direct care worker is proving services for, according to DHS. For the enhanced rate or budget, workers must provide services for a person who is eligible for 12 or more hours of PCA services per day. For the stipend, workers must provide services for a person who uses PCA Traditional, PCA Choice, CDCS or CSG. Home care workers should ask their provider agencies or fiscal support entities if they qualify. To register for the stipend and increased rate go here. The rollout of the enhanced rate program is just one care-related issue being watched closely. The second is the ongoing effort by Minnesota’s Olmstead Subcabinet to review and act on the direct care/support workforce group recommendations. The recommendations were reviewed by the subcabinet in July and contain several recommendations to attract, train and retain direct care workers. Implementation and work plans linked to the report will be the topic for the subcabinet when it meets 3-4:30 p.m. Monday, September 24. The report, which has won praise for its depth and thoroughness, is already being reviewed by state agencies and department. Assistant DHS Commissioner Claire Wilson said that department is looking not just at the report from a policy, legislative and community collaboration standpoint, but also at how DHS can support this work outside of the agency. The Department of Employment and Economic Development (DEED) is also looking closely at the report. Deputy Commissioner Jeremy Hanson Willis (DEED) said the department will be an active partner as recommendations go forward. He called the workforce shortage a “huge crisis facing our state” and predicted it would only get worse as the population ages.